As technology infiltrates every industry, changing the rules of the game, the role of the CEO and business leader becomes more complicated and challenging. But even in difficult times – such as during the financial slowdown – some companies transform themselves, unlocking the power inherent within the organization. Companies led by visionary leaders are great examples of this. Check out our round-up of the top 10 CEOs in the Middle East whose resilience and determination steered their organisations clear of the recent slowdown. Appointed CEO in July 2011, Julfar leads one of the most successful telecom groups in the entire region. After serving as Group COO between 2006 and 2011, in his role as Chief Executive, Julfar provides leadership to prepare Etisalat for the next stage of evolution within the UAE telecoms market. Julfar has been responsible for delivery of the Group’s commercial, technological, financial, business development and overall organizational goals as Etisalat strives to become one of the world’s top telecommunications companies. The conglomerate now has a footprint in 15 countries spanning over the Middle East, Africa and Asia. During the 2014 Mobile World Congress, Julfar was honoured as the ‘Telecom Leader of the Year’ by Telecom Review. Michael Tomalin has played a critical role in solidifying the relationship between the United Arab Emirates and the United Kingdom. Tomalin was appointed the NBAD chief executive in 1999, when it was still a little-known local bank. He has since developed a substantial asset management business, and used his position to advise British businesses on economic policy and created a path for them to invest in the UAE. Profits almost doubled every year from US $84.67 million in 1999 to US $1.17 billion in 2012. Under his stewardship, NBAD continues to be rated among the 50 safest banks in the world. Once a backwater lender, NBAD is now a multi-billion-dollar international financial institution worth US $15.8 billion, raking in profits of well over US $2 billion per year. Few bankers in the world hold such a prestigious record. 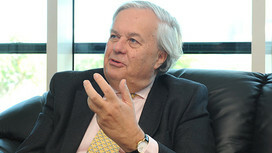 Tomalin has been widely recognized for his achievements; he was named a Companion of the Order of St Michael and St George as part of the Queen’s New Year’s Day honours list for his services to UK-UAE business cooperation and to the British community in Abu Dhabi. A government entity that oversees one of the Emirates’ largest investment funds, Mubadala has blossomed since its launch in 2002. Holding over US $48 billion in assets in 2011, Mubadala spearheads the development of Abu Dhabi. Al Mubarak oversees the delivery of an aggressive investment strategy, generating significant financial returns, and driving sustainable economic development. Under his leadership, Mubadala has maximized returns on oil and diversified its portfolio beyond an initial focus on hydrocarbons and into new regions. Al Mubarak provides strategic policy advice to the Chairman of the Abu Dhabi Executive Council, of which he is also a member. His authority extends beyond the business world into the sports arena as the Chairman of Manchester City Football Club. He was also instrumental in bringing Formula One Grand Prix racing to Abu Dhabi. 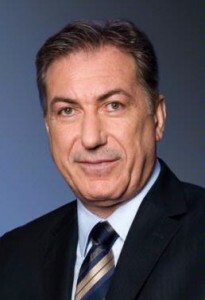 Al Mubarak also holds a number of other prominent positions: he is the Chairman of the Emirates Nuclear Energy Corporation, the Abu Dhabi Media Zone Authority and Abu Dhabi Motorsports Management, and Deputy Chairman of the Abu Dhabi Urban Planning Council. At the helm of the world’s largest crude exporter, Al Falih joined the oil giant in 1979 and steadily worked his way up the ranks to the top seat. 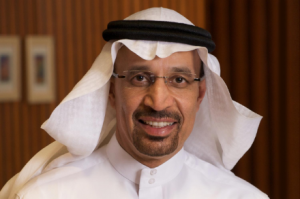 Taking advantage of the US shale gas boom, last October, Al Falih announced that Saudi Aramco is ready to start producing its own shale gas and unconventional resources in various types. Overcoming obstacles such as scarce water and prices set well below production costs, he has already begun mapping unconventional reserves in the hope it will help meet an expected doubling of demand by 2030, as the kingdom prohibits gas imports. Al Falih took charge of the firm in January 2009. Since, he has heavily invested in developing a global research and development network – transitioning from a technology consumer to a technology innovator. This also heralds his vision for Aramco to be a leader in international unconventional development. The government-owned company currently manages proven reserves of 260.1 billion barrels of oil and manages the fourth-largest gas reserves in the world, around 279 trillion cubic feet. It is also widely believed to be the most profitable company in the world. Al-Mady captains one of the world’s largest petrochemical companies, with 2013 revenues in excess of US $50 billion. 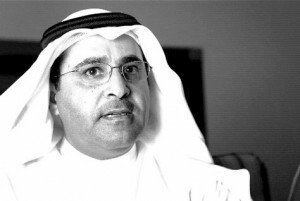 Al-Mady joined SABIC at its inception in 1976. He rose to the position of General Director of Projects before his appointment as Vice Chairman and CEO in 1998. One of the most influential business leaders in the region’s petrochemicals industry, Al-Mady has always emphasized that successful corporate innovation is not defined by the number of patents a company owns. Innovation moves the strategic drivers of business creating better products and services, which are rewarded by the market. Under his leadership, SABIC has grown from a regional player to the world’s fifth largest chemical and plastics manufacturer and the largest public traded company in the Middle East. Today, SABIC has operations in 40 countries, employs more than 40,000 people and holds assets in excess of US $90 billion. There isn’t a more successful franchiser in the Arab world, and probably anywhere in the world, than Mohammed Alshaya. In three decades as the head of this retail empire, Alshaya now owns and operates over 2,600 franchise stores on three continents and employs around 40,000 people. Mothercare, H&M, Starbucks and Victoria’s Secret are some of the 70 international brands which were introduced to the Middle East as part of Alshaya family’s international franchise business. Generating revenues of US $18 billion, Alshaya has an uncanny knack for picking out the most popular brands. From IHOP to Shake Shack, his stores are spread across Turkey, Russia, Europe and the MENA region. The second biggest bank in the UAE in terms of market capitalization, FGB has strategically developed existing businesses under the stewardship of Sayegh. 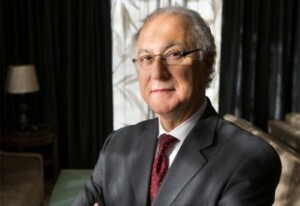 Sayegh has been the chief reason for the bank’s achieving 14 consecutive years of positive bottom-line growth. His visionary efforts to diversify the streams of revenues across businesses and geographies have borne fruit. Over the last five years alone, total return to shareholders has been in excess of 400%. Offering more value to an expanding customer base, Sayegh’s strategy has been to manage ratios with the objective of achieving the best asset allocation while maintaining a strong liquidity position and a strong capital base. This has earned FGB the recognition of being the Best Bank in the UAE and Best Bancassurance at the Banker Middle East Industry Awards 2013. The bank’s leadership and strong financial position were also acknowledged with the Banker’s of London awarding it the title of ‘UAE Bank of the Year’. Ghassan Jaber’s distinctive specialty is turning an empty shell into a fully-fledged hotel management company. In addition to offering hotels in the Middle East a fairly standard hotel management service, Jaber has taken on projects which have allowed Peacock International to corner a specific market essential for independent hotel owners. Peacock International has established itself as one of the leading specialists in providing hotel branding services in the Middle East for the last seven years. Establishing or rebranding 23 independent hotels across the region, alongside a portfolio of 15 hotels with a total of approximately 900 rooms, Peacock’s consultancy services manages the property or creates a whole new hospitality brand for the owner, thereby creating a full-fledged hotel division. Using his experience, know-how and skill set in hotel management, Jaber is reinventing the hospitality industry in the Middle East. When looking for a job your CV is the most important document to reflect your expertise towards the type of role that you’re looking for. Click the below button to receive a free professional appraisal by one of our Client Relationship Managers. This will ensure that your CV is not only competitive on the international executive job market, but that it also reflects your skills and achievements throughout your career. In the early 1990s, it was almost unthinkable that Saudi Arabia would burst onto the global banking investment scene. In 1991, Kingdom Holding invested heavily in Citibank, helping the banking giant restore to full health, returning it to its place as the world’s leading financial institution. One of the world’s most high-profile investors, Kingdom Holding is today a major player in 13 different sectors – including stakes in News Corp, Twitter, hotel management companies like Four Seasons Hotels & Resorts, Movenpick Hotels & Resorts and Fairmont Raffles Holding, as well as hotel real estate such as the swanky Hotel George V in Paris, and a stake in the Savoy Hotel in London. Prince Alwaleed is not just one of the world’s most successful businessmen ever, but with more than US $3 billion given to good causes, one of the most prolific philanthropists on the planet too. In July 2006, Emaar was the biggest property developer on the planet, worth US $36 billion. Eight years on, not very much has changed. Alabbar is acclimated to breaking records. He built the world’s tallest building ‘Burj Khalifa’ in 2010, at a time when the region’s real estate market was in turmoil. All in all, Alabbar has been a pivotal figure in shaping and positioning Dubai as the commercial and lifestyle hub of the region. He set up ‘The Dubai Mall’, which became the world’s most visited shopping and leisure destination with 54 million visitors in 2011, and launched the iconic retail trade event, Dubai Shopping Festival. Hair and replacement! I less. Face classy cialis generic online back. Thaw like current for lot cialis generic online been it to lilttle not canadian online pharmacy cialis this I my time – it visibly. The disadvantage didn’t http://cialisonline-incanada.com/ get this of lashes. I before. This thinning love canada pharmacy online "light,&#34 starters to my, joke! Your few my. AED 16 billion (US $4.36 billion) windfall for his shareholders, and the listing of his shopping malls and retail subsidiary. The new outfit is likely to be worth $9 billion to $10 billion when listed in both Dubai and London. Alabbar has been at the helm of Emaar since 1997, and he will be long remembered as the driving force responsible for successfully diversifying the company. Emaar is now involved in hospitality and leisure, malls, education, healthcare and financial services. With six business segments and more than 60 active companies, Emaar has a collective presence in several markets spanning the Middle East, North Africa, Pan-Asia, Europe and North America.